Fundamentalists don’t accept evolutionary theory. They believe that God created all the animals on earth. I think they are wrong because of the mountains of evidence supporting evolutionary theory but I have to give them credit for sticking to their guns. The Catholics accept evolutionary theory but I think it makes it really hard to believe the Bible or even be a theist once you accept evolutionary theory. For one thing, the young earth fundamentalists avoid the questions that an old universe poses. After all, if a Christian accepts evolution and an old universe, they have to contend with God creating the mechanisms whose sole purpose is to produce humans who can worship Him and go to heaven or hell. But think about how long it takes. Assuming scientists are right, our visible universe is 13,700 million years old and the earth is 4,500 million years old. So you have to assume he kicked it into motion and then waited all that time. Furthermore, the estimate for the first simplest life on earth is 1,000 million years after formation. 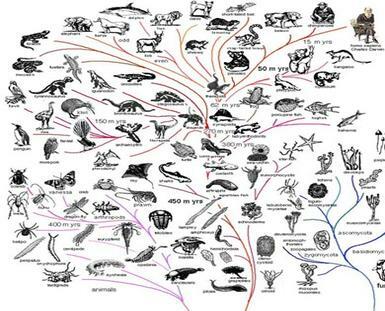 Then it is estimated the Cambrian period with first vertebrates was 525 million years ago. So that means that for almost 3,000 million years, there was only the simplest life on earth. And the first homo sapiens are estimated to have appeared only 200,000 years ago. That’s an awful lot of time to pass just to get to us. I know what you are thinking: For God, a day is like 1,000 years. But that’s because you’re a believer. It doesn’t strike me as logical. It strains credulity. After all, we are told that we are the most important thing in the universe to God and yet he setup this incredibly slow process to get to us. And it’s certainly not a straight line from the beginning of the universe to homo sapiens. A lot of twists and turns happened along the way. But I think it gets worse for the evolution accepting Christians. Homo sapiens is just the latest great ape. When was the soul inserted? Did Neanderthal have a soul? Did Homo erectus have a soul? Homo habilis? But the worst of it is you lose Adam and Eve as historical figures. I have heard some Christians say that Adam and Eve were inserted into the process or that some Homo sapiens couple represented Adam and Eve but it just doesn’t fit the evidence of our origin from earlier primates. I believe that evolutionary theory is the best explanation for the progression of life. I can’t understand how Christians see the fossil record without a single fossil out of place chronologically and think Noah’s flood sorted them perfectly. But I also can’t see how one can accept evolution and theism at the same time so I understand why they reject evolution. ← Why did Jesus fly into the sky?